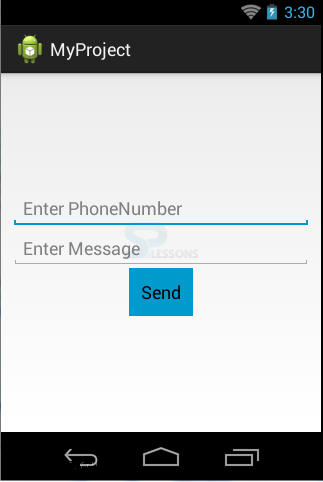 In this chapter, we will explain you how to send a SMS in android using a Built-in SMS App or SmsManager. The application is simple and easy to build. SmsManager class handles the SMS process. To send an SMS, you should get an instance of SmsManager class and add permission to SEND_SMS in the Android manifest file. The following examples illustrate how to send an SMS. It’s like a custom SMS. It is using an Intent. 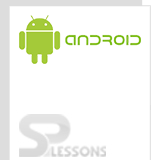 You need to declare SMS_SEND permission in AndroidManifest.xml. •divideMessage(String text): Divide a message text into several fragments, none bigger than the maximum SMS message size. •sendTextMessage(String destinationAddress, String scAddress, String text, PendingIntent sentIntent, PendingIntent deliveryIntent): Send a text based SMS. •downloadMultimediaMessage(Context context, String locationUrl, Uri contentUri, Bundle configOverrides, PendingIntent downloadedIntent): Download an MMS message from carrier by a given location URL. The following example illustrates the use of SmsManager.